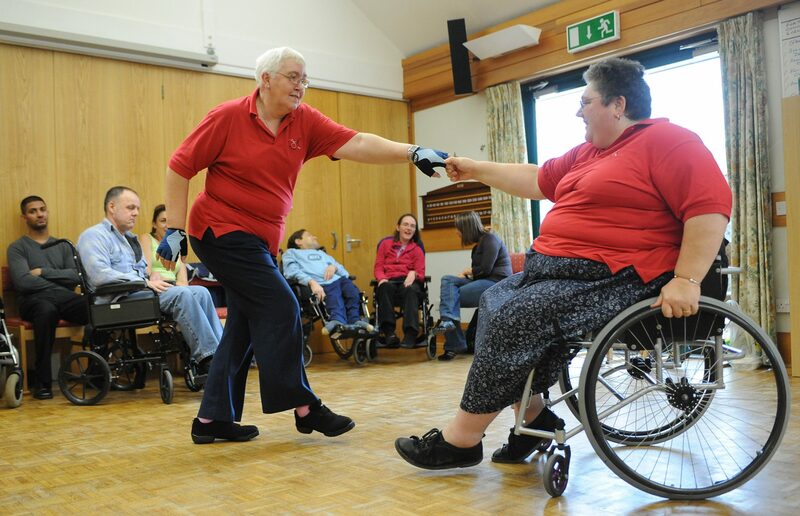 The roots of wheelchair dancing in the UK can be traced back to the late 60s when a rehabilitation centre in Scotland was teaching people how to manoeuvre their wheelchairs and realised this could be done to music. A Wheelchair Dance Association was set up in the seventies and although team dancing developed, the international competitive style did not catch on. In 2006, our co-founders Sue Cummings, Ruth Boyne, Linda Wilson and Nigel Cummings established the Wheelchair Dance Sport Association (UK), or the WDSA (UK). It evolved when a group of wheelchair dancers from Devon wanted to compete and Sue felt the international style was very different and went along to an Instructor’s course in Malta in 2004 to learn more about it. On their return to the UK they started trying this new style of wheelchair dance sport and began advertising it, with the aim of showing that everyone can dance regardless of their disability. Sue and Ruth both retired in 2017 and were replaced on the Board of Trustees. Para Dance UK aim’s to continue their vision and legacy. WDSA (UK) was the National Governing Body for the sport in the UK, as recognised by IPC, WDSF, WWDC and IDSF among others. As the charity grew, the Head Offices moved to North London to be central to the UK in 2012. The charity started developing new ideas around inclusive dance to include a wider range of people from the disability community. After the International Paralympic Committee rebranded the sport worldwide to Para Dance Sport in 2016, the WDSA (UK) followed suit in 2017. They are now known as Para Dance UK. Wheelchair Dance Sport has been defined as a sport that “involves athletes with a physical disability which affects the lower limbs.” However, this definition has since been expanded to incorporate upper limb disabilities, dual disability and multiple disabilities. In 1998, Wheelchair Dance Sport became an International Paralympic Committee (IPC) Championship Sport and the World Dance Sport Federation (WDSF) has entered into partnership with the IPC. Wheelchair user Els-Britt Larsson was one of the pioneers of wheelchair dancing when it originated in her native Sweden in 1968 for recreational and rehabilitation purposes. From there the sport’s popularity grew and in 1975 the first competition was organised in Vasteras, Sweden involving 30 couples. Two years later in 1977 Sweden staged the first international competition and several regional and international competitions soon followed. In 1984 Munich, Germany staged the first Rock’n’Roll European Championship for wheelchair dancers and the following year the Netherlands hosted the first unofficial European Championships in Latin and Standard. The first World Championships took place in Japan in 1998, the same year the sport came under the governance and management of the International Paralympic Committee. At the 2006 World Championships in Papendal, the Netherlands, duo-dance was presented for the first time with two Standard and three Latin being danced. In 2014 singles and freestyle (singles and combi) were introduced as the part of the official programme. The format of wheelchair dance sport competitions is very similar to those for non-wheelchair dancers including Beginner Competitions and Intermediate and Championship level competitions where the five dances for Ballroom and Latin categories are danced. There are two categories for the disability competitions which are: Class 1 for severe disabilities and Class 2 for those who do not have severe disabilities. There are also two types of competitions: Duo – where the two dancers are both in wheelchairs and Combi – where one is in a wheelchair and one is a non-disabled partner, which currently seems to be more popular. Age categories are not currently well established, but some Junior and Senior events are developing as the popularity of the sport has grown. The WDSF rules for wheelchair dance sport are as much the same as those for non-wheelchair dance sport. In 2016, IPC rebranded numerous sporting disciplines including dance sport and renamed it World Para Dance Sport. Progress is being made worldwide as, towards the end of 2017, World Para Dance Sport has been shortlisted to be entered into the 2024 Paralympic Games in Paris, France. Team GB’s top couple, Paula Moulton and Gary Lyness are ranked 6th in Europe.